Flyte Systems announced that it upgraded the FlyteBoard at the LaGuardia Plaza Hotel to display property promotions and meeting information. 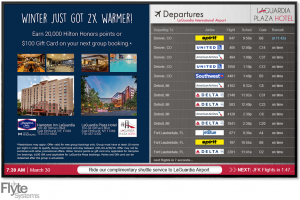 The new functionality enables the LaGuardia Plaza to show event notices, wayfinding, and revenue generating property specials on the same screen with FlyteBoard real-time airline schedules for LaGuardia and John F. Kennedy International Airports. “Flyte Systems is a truly beneficial addition to the LaGuardia Plaza Hotel’s guest services and property resources,” said Mary Louise Hartline, property director of sales. “Our guests are up-to-date on their flights and our hotel events and promotions look great on Flyte Systems’ professional displays. Flyte Systems’ support and responsiveness to our staff’s questions is impressive. FlyteBoard can vary the speed at which our content is displayed. This coupled with the ease of uploading specials and in-house promotions next to airline information is a valuable travel tool for today’s guests. 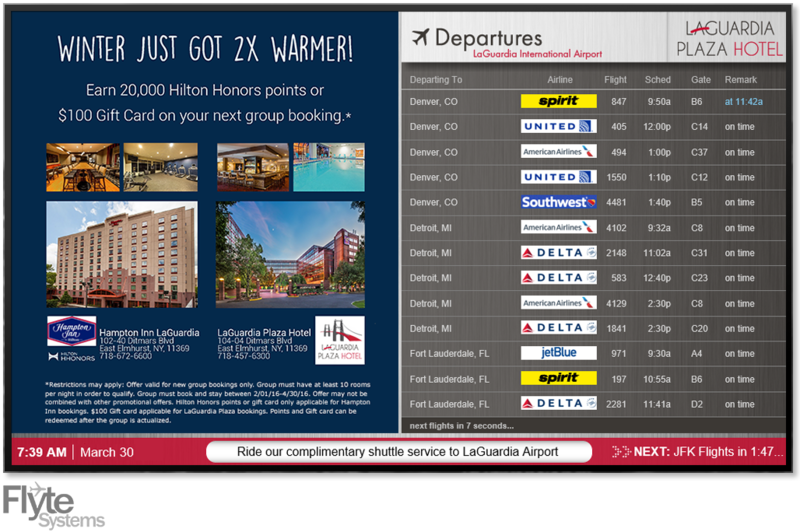 Flyte Systems gives LaGuardia Plaza Hotel the capability to provide clients with what they need on demand.” Hartline noted that the LaGuardia Plaza recently used its FlyteBoard to promote a Valentine’s Day Special that was well received. Flyte Systems is the leading provider of cost effective airport travel and flexible digital signage property information. The company delivers displays and digital signage content for the hospitality, corporate training center, digital signage and convention center industries and related businesses. Flyte Systems is a division of Industrial Television Services (ITS), based in Chicago. ITS is a respected digital signage solutions company with more than 50 years of experience specializing in real-time information delivery.